Sometimes, as moms, we tend to overthink things. (Naw, not us?!) Hey, I’m as guilty as anybody. But once I had twins, certain things had to get really simple really fast. That’s how I found out about the Antilop high chair from IKEA. when my twin boys came along 20 months after Wade, I knew I needed another option. I wanted something with a plastic tray you could take off and hose down. I also didn’t want fabric anywhere. I don’t care if it’s machine washable. Who has time to strategically run a load of laundry between meals?! I searched online for a high chair I’d used at a beach house once that had simple lines, hard surfaces and a tray that came off. When I found it, I actually contemplated dropping $300 on a model (well, $600 on two of them) before I read the reviews at the bottom of the listing. Real live moms wrote about how it was not at all easy to clean, as advertised. So I knew that one was out. My husband was nice enough to send me a Consumer Reports list of choices for the best high chairs but again, I kept reading terrible reviews, particularly when it came to cleaning. At that point, I did what I often do in times of “crisis:” I reached out to fellow twin moms through the Charlotte Mothers of Multiples club. That’s how I found out about the IKEA antilop high chair. I knew IKEA made a high chair, and I had it in the back of my mind to search it, but given the way a lot of IKEA furniture is made (lightweight and not exactly sturdy) I wondered about the safety of it. I was going to have to leave my boys in those chairs unattended sometimes. But one after another twin mom told me to get the IKEA high chairs. Not only were they easy to clean, they came apart, so you could stack them (hey, space saving!) or even pack them to take on a trip. And here’s the kicker: they cost $22.99 apiece. OMG, right? For that price, I could just buy two and if I didn’t love them, put them at a relative’s house we occasionally visit or give them away. The people who make expensive high chairs are going to hate for me this, but the IKEA antilops are awesome. They are everything I’d hoped they’d be. 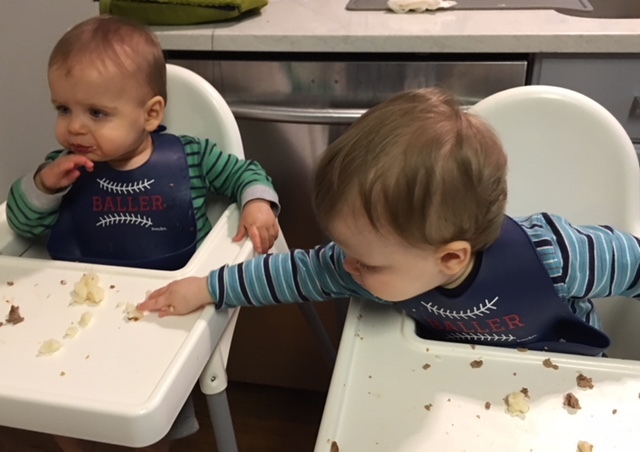 Our twins are at that age where they love to touch, feel, and toss food. So for three meals a day, they make a TOTAL mess, and with two of them it’s not like I can sit there and play defense, you know? 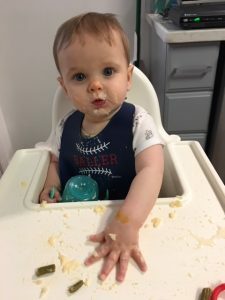 But afterward, all I have to do is wipe these high chairs down – both trays and seats – and put them back into a corner of the room. (The high chairs are so light; you don’t have to have them “out” all the time.) And yes, you can take the trays off and hose the whole things down, which is what my gracious mom did after our twins’ first birthday party. They were as good as new. The IKEA antilop high chairs are so inexpensive and easy, you could actually buy extras and put one at the grandparents’ house, the beach or mountain house, or just pack one (or two?!) with you to take on a trip. I’ve even thought about taking them with me to restaurants where I know the high chairs are rickety and not exactly clean. 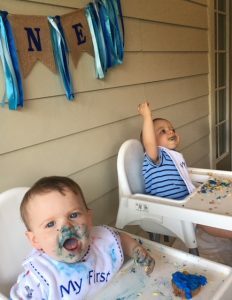 I buckle my boys in with the straps – though I know not all moms do – and I feel like they are secure, even when their older brother likes to come up and razz them. I don’t let him hang on the trays though like he’s occasionally tempted to do. My one and only complaint is something that a twin mom had warned me about, the trays are pretty hard to get off. You have to pull with quite a bit of force to snap them off. So usually I just clean wipe them clean and save things like spaghetti night for cleaning them under the faucet. And the more often I take the trays off, the easier it gets. Believe it or not, nobody is asking me to push or peddle this product. This is just one of those blog ideas I’m doing out of the kindness of my heart – and because my mom suggested it and I thought it was a great idea! So Mamas (or Dads) if you want a simple solution to a real pain-in-the-rear cleaning problem, the IKEA antilop high chair is so the way to go.